Last night we enjoyed a spectacular Matric Dance with a most appropriate theme: “Life is a Journey”. This is the last time that the matric class will get together at a social function as a group and they certainly made the most of it! The décor was superb and I am very thankful to Trudy Hoefnagels, Elmien de Kock, Wendy Rohrer, Leanne Gordon, Karen Newman, the events coordinator, Caitlin Hanley, and all the matric mothers who helped make the evening such a special occasion. Michael Houlie will take part in the SA short course swimming championships in Durban, and William Rose will be representing the Western Province 7’s rugby team at the inter-provincial tournament in Kimberley. Ryan and Mitch Labberte, Murray Gordon and Stefan von der Heyden will be representing Western Province at the National Fly Fishing Championships to be held on the Orange River during the holidays. We wish these boys all the best. Many of our Grade 10s leave on exchange in the next few days and we wish them well. I know that everyone in the Bishops Community has been praying for and supporting our Head Boy Christian Rohrer on his journey of treatment and healing. Christian completed his chemo treatment earlier this month and following scans, received the wonderful news from his doctors two weeks ago that he is in the very top bracket for full recovery. He will continue to be monitored carefully but overall this is tremendous news. I know that Chris’ family are very appreciative of the overwhelming support and love they have received from the entire Bishops Community. Chris will be writing his final exams with the rest of his classmates next term, a wonderful outcome! 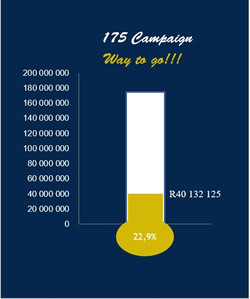 The Bishops Trust would like to thank everyone who has contributed to the 175 Campaign this term and is proud to announce that R40,132,125 has been pledged thus far. I would like to wish you all a wonderful, albeit short, holiday with your families. Maree and I, together with our school archivist Dr Paul Murray and Chairman of Council Mike Bosman, are very fortunate to be travelling to Europe as part of an OD contingent which is going on a tour of the Western Front. On Tuesday 3rd October we will be participating in a special ceremony at Ypres where we will be unveiling a plaque to commemorate the 112 OD’s who died in WW1. We will also use the opportunity to visit our daughter in London and son in Frankfurt! Enjoy your children while you still have them at home!